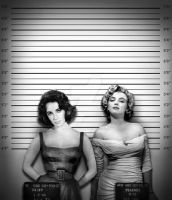 Discover Old Hollywood's New Attitude. 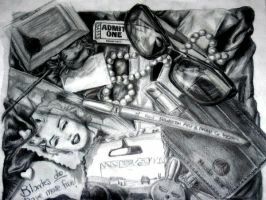 First draft, peer-evaluated concept piece to commemorate Marilyn Monroe’s birthday in June of 2011. Showcasing a contemporary juxtaposition with 92 digitally rendered image layers by Brailliant. I would like to thank everyone for all posts and pins on Pinterest, Instagram, and Tumblr. Visit: www.brailliant.com to see the final version, available on canvas. All proceeds will benefit Brailliant, an educational tool dedicated to teach the visually impaired and the blind about art and art appreciation.This image is copyright protected. For sharing purposes and reposts, please site source. Much like Marilyn Monroe and James Dean, New York City skyline never quite loses its luster. Based on the 2011 portrait by the same artist. Derived from an original drawing on board then further developed digitally. Portrait compiled by 72 rendered image layers formed the idea behind a large scale portrait handcrafted in 2014. Artwork of Brailliant art listed elsewhere under a different name are not credible, low quality and a violation of policy. It is a breach of U.S. and International law, and Brailliant is committed to respond to alleged copyright violations. U.S. and International Copyright Office issued regulations solely to Brailliant as the authorship of the image and secure statutory copyright protection for the work in terms of litigation advantages and evidentiary value, as well as secure the opportunity for valuable remedies. Creatives put so much time and effort and creativity into their work. 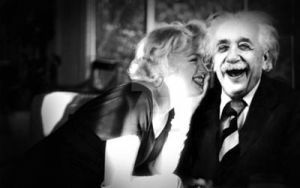 We love to share it, we love to inspire and we love that it is universally available for everyone to enjoy. 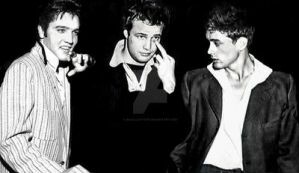 Most of us don’t want to be famous or have our faces plastered over the world’s media. We simply want credit where credit is due – an acknowledgment that we have created the image and it is our work that inspired. 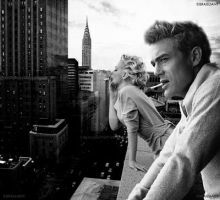 The 2011 portrait of James Dean and Marilyn Monroe together in the urban cityscape of New York (original source: www.deviantart.com/tag/brailli…) was a concept rendering originally submitted on DeviantART, a forum for art critique. Shortly after, it was shared without proper credit, nor permission and neglected to mention that it was a digitally manipulated art. It is not hard to imagine that it would challenge people's perceptions or perspectives that this image is real if the original source was not cited. It was shared on various social media since 2011. Re-saving out original JPEG image upon each save is doing more harm than it actually is. To see just exactly how much the pixels are altered try saving a JPEG multiple times. Every time a JPEG image is saved, compression algorithms are run to reduce the file size. Currently this image has 988,000 results on Google. This means that 988,000 times data was lost and quality is less than satisfactory for proper printing. 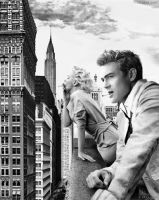 Original photo of Brailliant Art featuring Marilyn Monroe and James Dean in New York was uploaded in submitted on June 1, 2011, with image size 199 KB, resolution 449×673. For width and height for printed size (W x H) would approximately be 2.13" x 1.6”, that would be the size of a credit card. Digital photos don't take well to this amount of enlargement when original photo was not uploaded in high resolution. The quality seen elsewhere online is low and highly pixelated. If others claim you may receive this in 8” x 10”or more, expect to be disappointed. 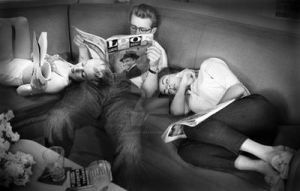 Wow, Is this a photo manipulation ? or is it real? !